Living in Adelaide, and especially in winter, you know that it's not necessary to make a restaurant reservation because who goes out in this sleepy city?! Well, it's time to bite my tongue because Tuesday night dinner at Plus 82 POCHA was the place to be! Every table was full of jovial chatty diners keeping nourished and warm with hot pots, Korean fried chicken and more. I (Amanda) was impressed how Plus 82 POCHA, which replaced Turi Bar e Cafe (our favourite CBD cafe for a freshly piped ricotta cannoli) had acquired quite the interest and following since it's opening in September 2017. On The Chopping Board (OTCB) was invited by Plus 82 POCHA for dinner. All food and beverages were provided on behalf of Plus 82 POCHA. On arrival, we discovered that the chef and owners of Plus 82 POCHA obtained their culinary education from Le Cordon Bleu (LCB). We knew then that we were going to be in for a real treat, thanks to our many visits and tastings at LCB Adelaide over the years. 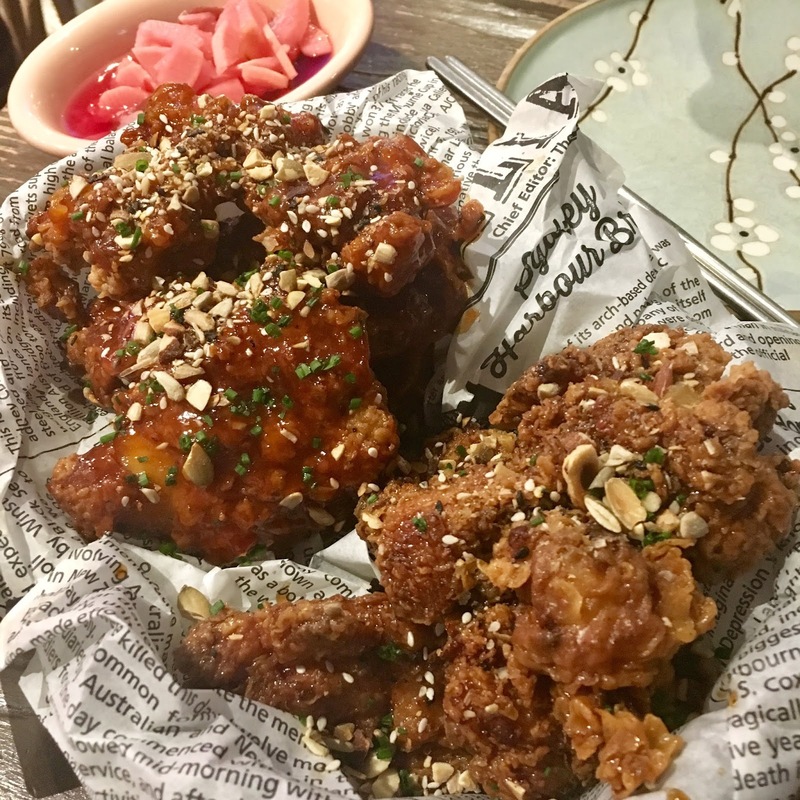 We happily started with the boneless Korean Fried Chicken (KFC). If you prefer to get stuck into KFC with your fingers then you have the option of ordering the chicken with the bones but tonight we attempted to be ladylike with our knives and forks! We tried the KFC with 2 different sauces, both house made, the sweet chilli sauce and the garlic/honey sauce. The chicken was delicious with a nice crisp outer and extra crunch thanks to the sprinkle of assorted nuts and seeds, tender juicy meat and both sauces adding even more flavour and some needed sweetness. Served with house made veggie pickles which was great to cut through the richness of the fried chicken, or lets face it when you're talking to a pickle addict (me Amanda! ), a great accompaniment for every meal. We were in KFC heaven! The Korean stir-fry spicy pork served with cabbage, carrot, onion and pork crackling (I didn't come across any crackling this time) was a dish suggested to be served alongside the 'Ssam', which was a plate of baby cos lettuce leaves, carrots, kimchi and pickles. 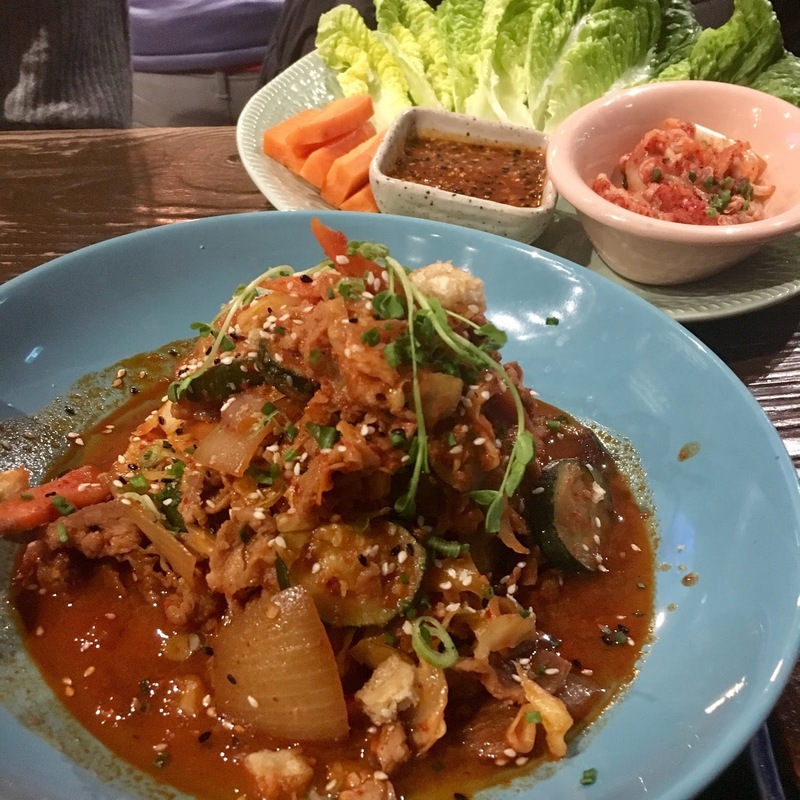 The idea was to spoon a bit of the pork stir-fry into the lettuce leaf, top with a carrot slice, some kimchi and a spoonful of sauce, roll up and eat! This was a fun and interactive dish and was a great way to cut through some of the spicy heat of the pork with the freshness of the lettuce and carrot. 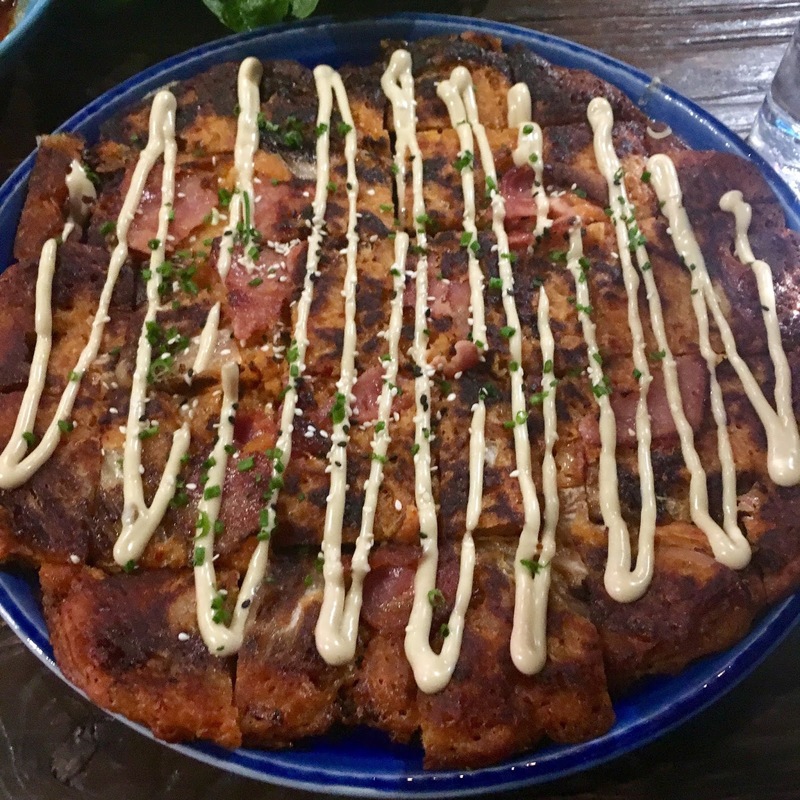 Lastly we enjoyed the kimchi pancake with spring onion, crispy bacon and aioli sauce, which if we had to pick a favourite, it just may be the pancake! 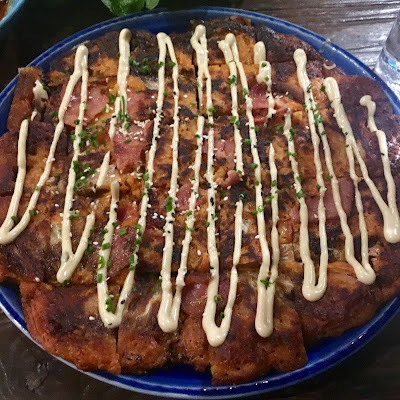 A little heat from the kimchi, a little crispness of the pancake and the bacon, a little saltiness and a little creaminess from that aioli, made for a lot of pancake deliciousness! This pancake makes a great sharing dish and can easily be shared between 4 people. We tried to share it between 2 people and well lets just say we were lucky to be able to take the rest home for later! We had a great, vibrant and tasty mid-week dinner at Plus 82 POCHA, and can easily see why it is the place to be! Open everyday except Mondays, we look forward to returning to try one of the 4 types of hot pots on the menu.